In 1866 or 1904 they may have not known the reason why apples where healthy for you, they just knew they where. But in the 21st century we do. Apples have flavonoids quercetin, epicatechin, procyanidin (B-2), and additionally, they are also good in tartaric acid. Together, these compounds help the body protect itself from the debilitating effects of free radicals. The apple is also a good source of B-complex vitamins such as riboflavin, thiamin, and pyridoxine (vitamin B-6). Together these vitamins help as co-factors for enzymes in metabolism as well as in various synthetic functions inside the body. The fruit also contains a small amount of minerals like potassium, phosphorus, and calcium. Potassium is important to cell and body fluids, as it helps control heart rate and blood pressure, and in turn counter acts the negative influence of sodium. 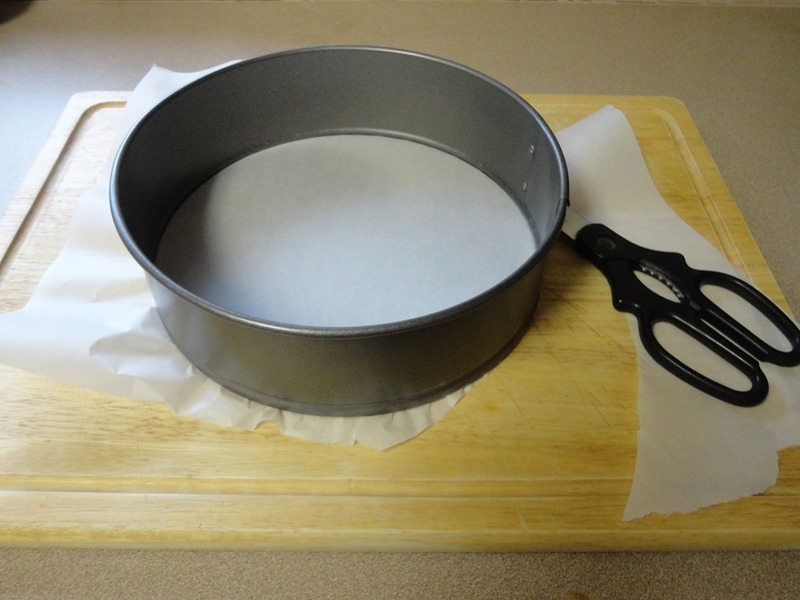 First preheat your oven to 350°F and line the bottom of a 8-inch round spring form pan with parchment paper. Then lightly grease the rounded sides with your choice of butter, avocado oil, or coconut oil. Coconut oil is neutral in flavor and will never add additional flavor to your cooked or baked goods. Be sure to cut off any excess parchment paper. First peel, core and chop apples into 1/3-inch cubes. Mix together apples, sugar, cinnamon and nutmeg in a medium bowl. Make sure apples are well coated with the sugar mix. Heat butter in a large non-stick frying pan (even better if you have a ceramic coated pan) over medium heat until the foam subsides. Add whole cloves so they infuse the butter and then add the apple mixture. Toss apples about until they just begin to soften, but not mushy, about 3-5 minutes. Transfer apples back to the bowl, discard cloves and set aside to cool completely while you prepare the rest of the cake. In a medium bowl and a hand mixer, beat cream cheese until smooth and creamy. Add sugar and vanilla extract and beat on medium speed until smooth and the sugar is mostly dissolved, about 40 seconds. Beat in the cinnamon, nutmeg and clove until combined. Add egg yolk and flour and beat just until incorporated and batter is smooth. Set this aside while you make the cake batter. In a small bowl, sift together flour, baking powder, baking soda, cinnamon, cardamom and salt. In another medium bowl, beat butter with both sugars until pale and fluffy, about 3 minutes. Beat in vanilla until combined. Add egg and beat until well incorporated and batter is fluffy, about 30 seconds. Add one-third of the flour mixture and beat on low speed until mostly combined. Beat in half of the evaporated milk until blended. Repeat this step by adding half the remaining flour mixture followed by the last of the milk, beating no more than 15 seconds between additions. After the last bit of milk has been added, beat on medium speed for 3-5 seconds to just make sure the batter is smooth. Fold in the last of the flour mixture by hand using a rubber spatula until evenly combined. Scrape batter into prepared pan and spread it out evenly. 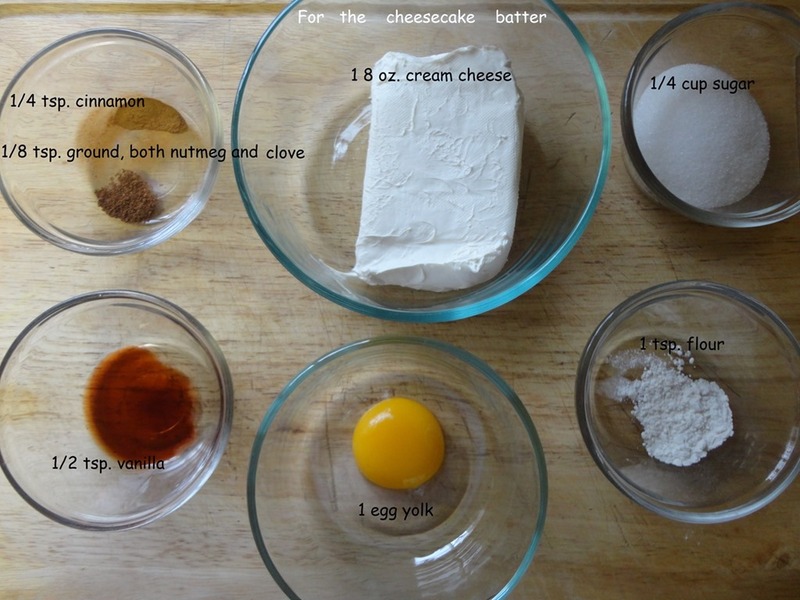 Spread cream cheese mixture over the cake batter. 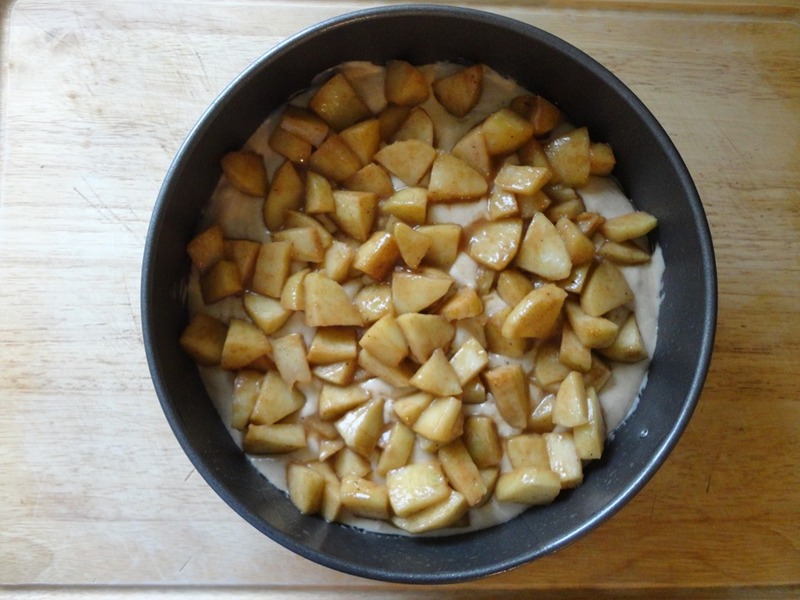 Gently spoon cooled apples over the batter in an even layer. Bake cake until the cake wobbles ever so slightly in the middle, 45-50 minutes. Transfer pan to wire rack and let cool completely. Plate and serve. Lightly grease an 8-inch round spring form pan with butter and line the bottom with a round of parchment paper. 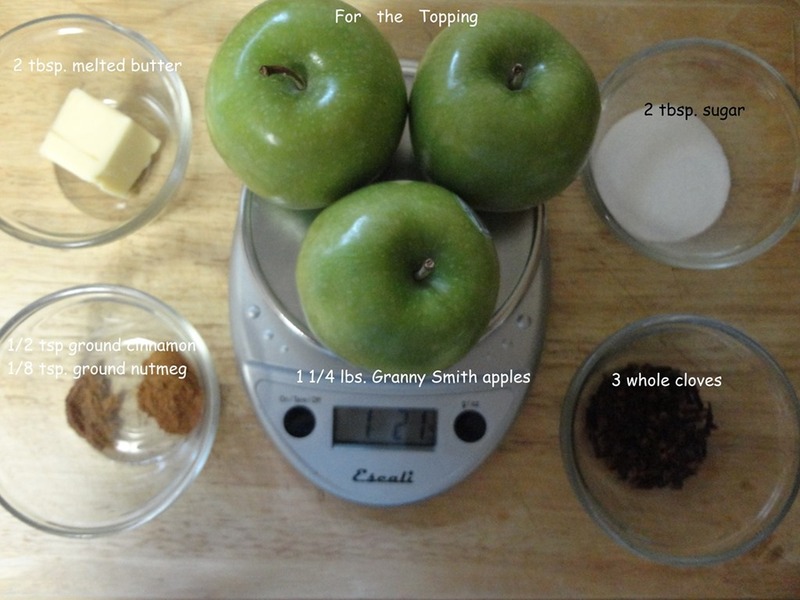 To make the topping, fold together apples, sugar, cinnamon and nutmeg in a medium bowl. Heat butter in a large non-stick frying pan over medium heat until the foam subsides. Add whole cloves so they infuse the butter and then add the apple mixture. Toss until they just begin to soften, but not until they’re mushy, about 3-5 minutes. Transfer apples back to the bowl, discard cloves and set aside to cool completely while you prepare the rest of the cake. To make the cheesecake batter, beat cream cheese in a medium bowl until smooth and creamy. Add sugar and vanilla extract and beat on medium speed until smooth and the sugar is mostly dissolved, about 40 seconds. Beat in the cinnamon, nutmeg and clove until combined. Add egg yolk and flour and beat just until incorporated and batter is smooth. Set this aside while you make the cake batter. Scrape batter into prepared pan and spread it out evenly. Spread cream cheese mixture over the cake batter. Gently spoon cooled apples over the batter in an even layer. Put cake into oven and bake until the cake wobbles ever so slightly in the middle, 45-50 minutes. Transfer pan to wire rack and let cool completely. 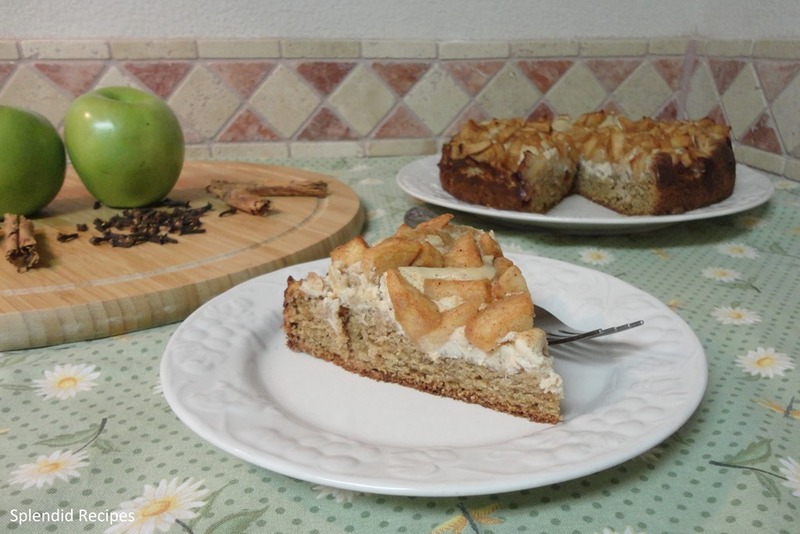 This entry was posted in Dessert and tagged Apple, apples, Butter, Carrot cake, cheese cake, Clove, Coconut oil, Cook, dessert ideas, Frying pan, Granny Smith, granny smith apples, Home, parchment paper, spice cake, spring form pan. Bookmark the permalink. ← What is Kitchen Gardening? Oh that looks very deli! Thanks and it was or is very deli!! Thanks for stopping by Chef. Hope all is well in España! !